Dignified, modern and inviting; the Aaron Outdoor Wicker Chair and Ottoman Set in Kubu will be a permanent fixture in your sunroom, garden or patio, creating your very own retreat! Our Aaron Outdoor Wicker Chair and Ottoman Set in Kubu is the incredibly comfortable best-seller from our all-weather wicker collection. Not sure if you need one or the other? The Aaron Set can be bought separately or together! Featuring a low profile, with deluxe, wide arms and base for ultimate relaxation, the Aaron Outdoor Wicker Chair and Ottoman Set in Kubu has comfort written all over it. This splendid chair and ottoman set is made from powder coated aluminium fitted with popular Viro® wicker, a through-dyed, polyethylene synthetic wicker which won’t morph, discolor or break off in harsh weather. Padded with a firm cushion base, with soft and luxurious back cushion, made from Sunbrella® fabric to ensure a long life. At Teak Warehouse, we don’t just have wicker! 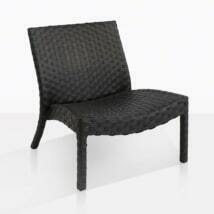 Choose from our vast array of expertly designed, luxurious outdoor products. If you love contemporary, state-of-the-art designs, then peruse our Stainless Steel lines! Perhaps you love the combination of old and new? Then Raw Concrete and Reclaimed Teak is right for you! Or if long lasting wood is what you’re after, then look no further than our wonderful range of A-Grade Teak. Teak Warehouse has the best range of furniture for outdoors. So whether your poolside is in serious need of some loungers, or your balcony for some bar furniture, maybe you need to relax on some deep seating in your backyard, or your want a beautiful dining set to host dinners – we got it covered! Everything you need to increase your living space to outdoors! Set up your Aaron Outdoor Wicker Chair and Ottoman Set in Kubu in a sun lit morning room for a superb spot for coffees or afternoon reading. The Aaron Outdoor Wicker Chair and Ottoman Set in Kubu also looks great poolside or at the fringes of one of our grand dining tables, as somewhere to put your feet up after a long lunch! The Aaron Outdoor Wicker Chair and Ottoman Set in Kubu is a steadfast favorite because it suits many different spaces. Try this divine duo on your patio with a wicker square or rounded accent Table in a matching hue of Viro® Wicker for a glamorous, tied together look that serves as your space for relaxing at the end of a long day. If you want to make the set more contemporary, add in some Raw Concrete or Reclaimed Teak, to add a little eclectic, yet tasteful blend of contrasting materials. Teak Warehouse can provide shipping assistance all over the country. We use a white glove delivery service, ensuring quality control. Simply inquire online or call us now for a quote. We are only too happy to help. 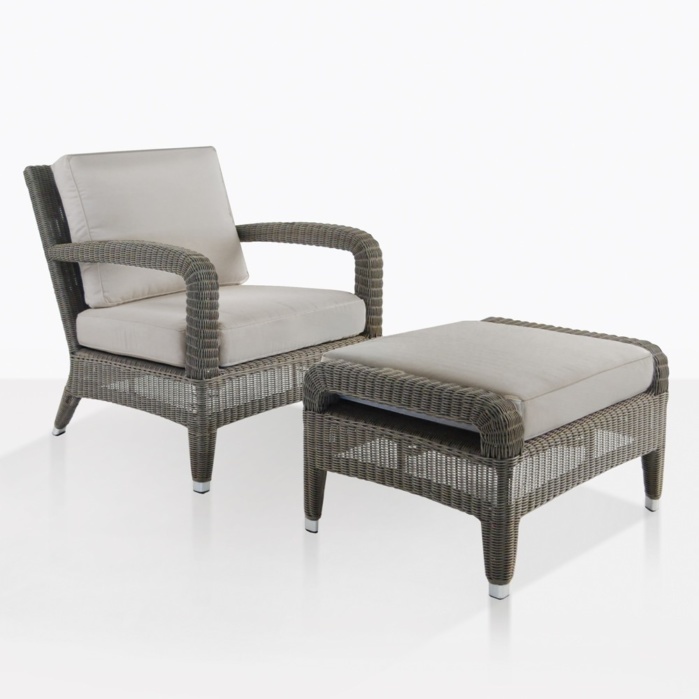 The Aaron Outdoor Wicker Chair and Ottoman Set in Kubu is an excellent choice for those who put comfort first. 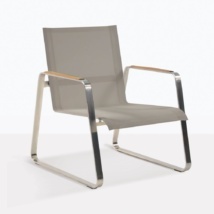 Enjoy the splendidly simple style in this luxurious chair.